The Honda HR-V, making its ASEAN debut in Jakarta, is drawing in the crowds at JI Expo, assisted by jaw dropping models. We’re not talking about the beautiful ladies gracing the stand (you’ll have to wait awhile more for that) but dressed up versions of the B-segment SUV, one from Mugen, the other by Modulo. The latter is striking enough with a chrome look and purple-tinged wheels (or is that pink?) but the Mugen is the mad one, with widebody extensions and super elaborate flower-spoke wheels. Body stripes in the tuning house’s trademark colours add to the “look at me” effect. The tuner boys in Sunway must be rubbing their hands with glee at the sight of this. The Modulo showcar is based on the HR-V 1.8 Prestige, and we know that from the LED headlamps with DRLs. The 139 PS/169 Nm 1.8 CVT model also gets nice things like a panoramic roof, a leather lined interior, reverse camera and six airbags. The 120 PS/145 Nm 1.5 variant, which can also be had with a five-speed manual gearbox in Indonesia, comes with an electric parking brake, ABS, EBD, Brake Assist, dual airbags, Vehicle Stability Assist (VSA), Ultra Seats from the Jazz, auto air con, keyless entry with push start, cruise control, shift paddles and leather seats, depending on grade. There are three: A, S and E.
Indonesian estimated pricing starts from 240 juta rupiah (RM64,907) for the base 1.5, rising to 350 juta rupiah (RM94,555) for the 1.8 Prestige. 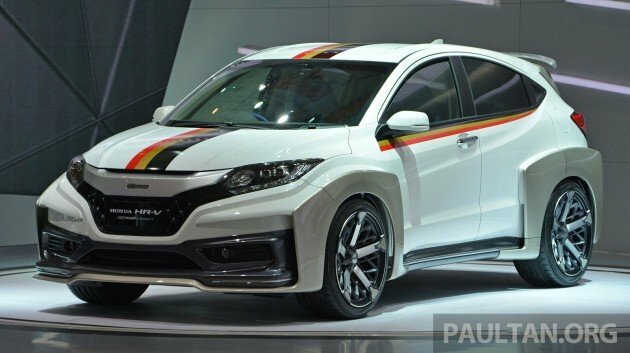 We’re expecting to see the HR-V in Malaysia next year. 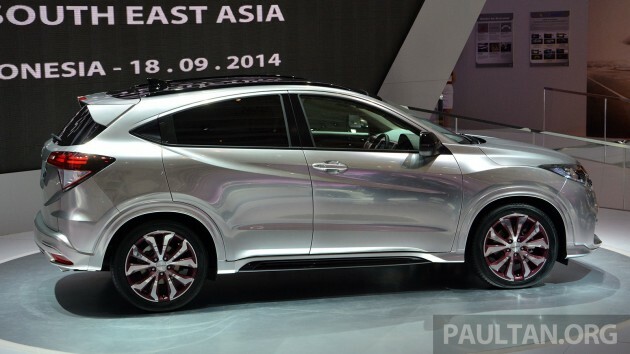 Full details, specs and live pics from IIMS 2014 in our earlier launch report.